Peter Lorre became known for his work as the creepy, slimey type of bad guy, epitomised by his role in Casablanca, but it was this film. 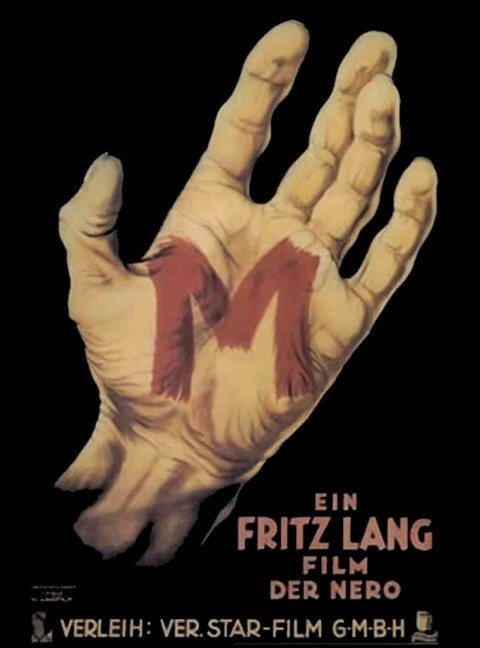 M, directed by Fritz Lang, that initially launched his fame, and perhaps led, in some measure, to his being type cast. Which is a damn shame, because he was a fine actor and director too, consigned to the annals for his stand out creepy antagonist roles, which only reflects a fraction of his talent. In this film, made in 1931, he still has the boyish roundness of face that leads the viewer to feel that yes, a child might relate to him, feel safe with him, whilst the bulging eyes and furtive glances tell us adults that he is not to be trusted, because this film, made by Lang in Germany, and quoted as being his master work, is about a child killer who lures the kinder away to their deaths with gifts of balloons and candy, evading capture til the criminal community get involved in the chase and finally corner him and put him to mock trial. The film itself emerges from German Expressionist cinema and preceded Film Noir, which would come a little later, and which Lorre would star in. 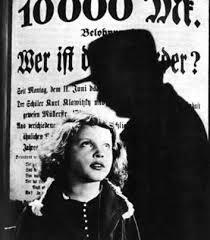 It has some little things, the use of shadow and a morally ambiguous protagonist, for example, that foreshadow elements of Film Noir, and is a classic example of early crime film genre. It’s a marked difference from Expressionism, however, aiming for realistic looks rather than theatrical looking painted sets, however it has some really interesting angled shots that hark back to the earlier style, and add a sort of jarring feel to the narrative. The story itself is unusual. It is a crime film, but it’s not about solving a mystery, as we know who the killer is, and there is no one antagonist who opposes our homicidal killer, but rather, two main groups. To open, the films shows that a killer has been taking children and killing them, so far getting away with it. The effect on society is to helplessly try to protect their children, and to jump at shadows, suspecting everyone who is nice the little ones, or anyone the police show an interest in. The public pressure makes the constabulary desperate to catch their man, but their efforts are in vain, because they have no clues, little evidence. They do what they can, but are largely frustrated. But when they start to harrass the criminal elements, limiting their nefarious businesses, the local crims have to search for the bad guy themselves, rooting him out and cornering him. Two things stand out for me, here. The way that the children trust the baby faced man, and their deaths are symbolised by a child’s ball rolling away, abandoned, or a balloon floating til it’s trapped in power lines. In a way, this is more menacing than seeing the deaths themselves, these powerful images. The second thing is that when confronted and at bay, at a mock trial held by the thieves, car sharps and pimps who have caught him, he points out that he is not as bad as them, since his crime is one that he is compelled to carry out, whereas theirs is one fallen into by laziness or cunning, ultimately by choice. It’s an interesting proposition, really, and shows a sympathy to the killer that does not make him less guilty in out eyes, but does make you think. 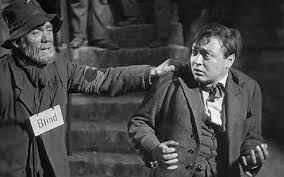 The film does play a little slow to a modern viewer, which gives the film a pleasantly measured pace, and focuses on some beautiful shots and mise en scene that give a sense of place and lifestyle, and Peter Lorre’s scared and tortured facial expressions are classic, but its a layered film that takes re-watching. Details like the killer eerily whistling a tune from Grieg’s In The Hall Of The Mountain King, a tune about a troll deciding how he’d like to kill Peer Gynt, echoing the story and sounding both jaunty and deadly. Both Fritz Lang and Peter Lorre would flee the Nazis, leaving Germany for France, and eventually the US, where they went on to active careers, though Lang would return to Germany to make his final 3 films, perhaps fleeing a reputation of being impossible to work with. And Lorre would live out a stunted career as the bad guy, with his work being appreciated more, perhaps, after his death in the 60’s. However, M lives on as a much loved classic, and is well worth watching. Next postHow Writing a Script is Good for Your Health. Looks good and spooky! Don’t know how I missed this one, but I’ll look for it. Total classic! You must watch.